I first wrote this post back in 2007. Yes, I know some of you may not have even been born yet, but I was well into my life as cook and baker, and shared what was one of my favorite knives at the time. Due to search engines, however, your past is always going to be hovering close to the present. One of the nice things about having a blog is that you can change it. We don’t often get a chance to change the past, with two thousand and eight blog posts under my belt, I’m fortunate that I can change my pants (or posts) whenever I want. So it’s time to revise it. 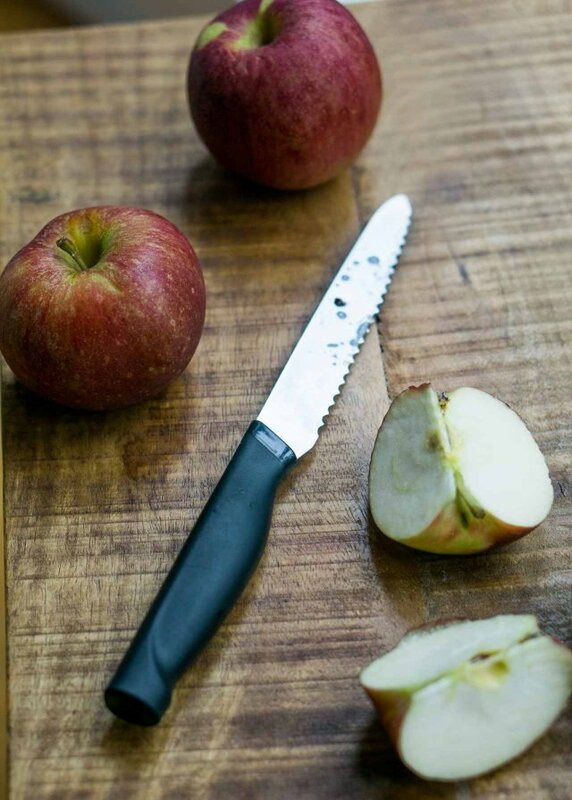 When I was a line cook, my favorite knife was not some fancy Japanese slicer that would allow you to cut a slice of apple so fine you could read the newspaper through it. When you’re working in a restaurant, you’re pretty much going full tilt as soon as you slip on your ugly, but comfortable work shoes (and believe me, I went through every kind of work shoe possible) in the pre-clog days (which I think may be over?) until the moment that all-important, post-work glass of wine hits your lips. 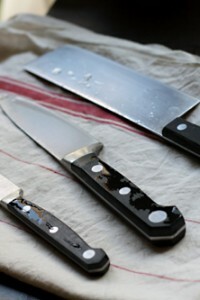 The three knives every cook needs, whether at home or at work, are a chef’s knife, a paring knife, and a bread knife. However every line cook (and home cook with a city-sized kitchen counter) knows that space is at a premium, and I added a small serrated knife to that trilogy collection. I loved that little knife, which cost me $7 at the time. So now it’s this little serrated number I’ve been reaching for, available as a Pro utility knife, or a standard model. It’s got it all; price, availability, and best of all, it’s sharp as heck. I’ve had one of these for a couple of years and it’s still as efficient as the day I bought it. 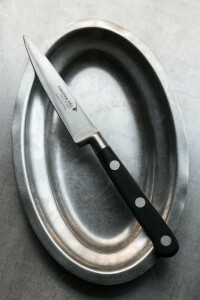 I use mine for everything: slicing crusty ficelles, roly-poly cherry tomatoes, beets, and especially excels at citrus. It does most jobs with the greatest of ease and its small size also makes it fabulous for space- (and money-) challenged cooks. So I’m going to be using this for the next few years. In fact, I bought two, one with the fancier handle (called the pro model), and the regular model, which you can find online, although I found the regular ones being sold at a hardware store somewhere in New York City for only $5.99. So the best deals are not always online. the last two times we’ve been in Paris, we’ve made a point of popping into Dehellerin’s to pick out a knife for us and one for a gift for our chef daughter. We manage fairly well in French, but had to use some English to ask what the French equivalent was for a boning knife. One of the fellows there doubles as comedian as he hustles through the crazily crowded shelves, and he answered our question with a “mais oui, un knife de boning”! and then started giggling madly, setting us off as well. We also got a serrated knife there, a longer blade than the one you describe — I’m really surprised how much we use it, probably more than any other knife in the block. And I thought I was weird for using and loving this knife so much. I can’t imagine tomato season without it, but, like you, I use it for a multitude of other things. materfmilias: Ever since the guys at Dehillerin went on commission, going in there is kinda intense. Talk about pressure tactics! A good tip is to get there early when most of the salesmen haven’t shown up for work yet—it’s far calmer. But after lunch is dicey as well: Last time I went in there, the guy who helped me reeked of booze and could barely stand up! Casey: These are the best knives for tomatoes ever, aren’t they? Such a deal! My other love (and another deal) are these little Quikut paring knives, are super-chep, which you can find in supermarkets and online. I brought a handful to Paris with me. Funny how those Wusthof knives show up everywhere. I found a few sets with that same knife in my local Marshalls store when we were living in NJ a few years back. Yes, it is a great knife. It even slices your fingers when you least expect it–proving just how very sharp it stays when it gets thrown around with other knives in drawers and packing boxes. My favourite knife right now is one of my MAC knives, I swear it looks like a miniature sword … when I first saw it I said to the salesguy “What the heck do you use that for”, he came back with a quick, “Pretty much whatever you want”. I had to laugh when I saw this post — a little more than a year ago, I picked up this exact same knife for about $6 at one of those gigantic summer Broadway Panhandler sales here in NYC. Since then, it’s been my one truly indispensable kitchen companion — sadly, I love it far more than the big-ticket Santoku that we received as a wedding gift a few months ago. It’s funny, we all have all this fancy equipment, but it’s some cheap knife that we fall in love with. I have a dinged up, scratched and dented roasting pan that I refuse to throw away, even though my huge, gorgeous All-Clad roaster is one heckuva magnificent specimen. David, that is my favorite cookware shop! I love it, it’s so much cheaper than Williams Sonoma and Sur la Table…and fulllllll….Let me know when you come back to my neck of the woods! I work almost exclusively with a cleaver, but could use a better small knife. Thanks for the tip! I tried finding your favorite knife (4.5″ Wustoff serrated) online at Zabar’s and they don’t show it. Then I looked at your other link, Amazon.com, and it shows as currently (and indefinitely) unavailable. Can you recommend where else I can look? Williams-Sonoma does not carry it. I live in Northern California. @Maria Gillette, they might not have Wustof but have you tried Ace Hardware and Smart & Final for a serrated paring or utility knife? I have a set of serrated steak knives of unknown brand and I find that we use them probably more often than the Meissermeister (sp?) knives on the block. Bed Bath and Beyond shows them online. My local one doesn’t carry them (San Mateo) but yours might. Hi Maria: You might want to try your local Sur La Table or give Zabar’s a call. Follow the link in the post for ‘cooking school’, which leads to where I got mine when I was in the states; but they do mail order too. It’s official name is the Wusthof Silverpoint 4100, which you can Google as well. Good luck! This is a great recommendation! Any others for good knives? One of my favorite Bread knives is made by Victornox (who makes Swiss Army Knives). This one is a great deal and I’ve had one for over 20 years that’s still razor-sharp. They also make one with a Fibrox handle which costs a bit less but I’ve never used it, so I’m sticking with what I know. As for other knifes, I think a 3″ or 6″ paring knife and 8-12″ Chef’s knife should take care of most other needs. I’d buy a heavy-duty one of each category since they take more wear-and-tear than the serrated knives. Whichever in each range feels best and most comfortable in your hands. Most people don’t need a zillion knives; just a few very good ones should do it for most uses. At last! Somebody who agrees with me about knives. I bought MY favorite knife (unbranded) which is exactly like the one in your photo, although red, at Sur La Table in a bin with many others. I bought 3 of them, gave one to my son and daughter-out-law and kept the other in reserve. I lost the reserve on a camping trip. It is now their favorite knife. This one was under $5. It’s perfect for almost everything. My other Wustoff knives, those that cost hundreds, sit in the drawer making cutting remarks (get it?) about the little red knife. Hmmm, maybe I could compose a hit song ala Jan and Dean: My Little Deuce Knife…She’s my little deuce knife, you don’t know what I got. I agree completly with you abut this knife. My son(who loves to cook) and daughter-in-law gave me this knife for my birthday 4 years ago and I couldn’t live without it. Perfect for tomatoes as well as key limes. Margaritas wouldn’t be same without it. The little, cheap, plastic-handled Victorinox serrated paring knives could be a good replacement for your Wusthof. They’re under 10 euros and last for donkeys’. Gave myself a nice little flesh wound the first time I used one, they’re sharper than they look! I have two of these, I brought from France something like 5 years ago, and they still sharp as day one! Too funny. I have a similar knife and I use it constantly. Great workhorse for sure!! We get the sharpest little serrated knives for free when our relatives send us a gift box of sausages from Usingers in Milwaukee! I think they’re Quikut knives. My mother in law had the DULLEST knives I’ve ever seen, but after decades of use, her little serrated knives from Usingers were the only sharp knives she owned. I remember getting little Quikut knives (not serrated) for 99¢ that was super sharp little devils. I tried to find them a few years ago and couldn’t find them. I’ve seen similar-looking knives like these, which look like them, but I’m not sure. As someone who has boycotted Amazon (and now Whole Foods) for years, I feel compelled to mention that Oxo products are available in many places, including own Oxo’s own website, oxo.com. Trolling through it will uncover items you didn’t know you needed, but do! All orders of $19 and up get free shipping. And no, I have no connection with the company except as a satisfied consumer. Could not survive (well, easily) without their jar opener. More than 30 years ago my daughter gave me a little knife that she said was for slicing tomatoes. It’s not actually serrated but the edge of the blade has a row of scalloped shape cuts in it and it has a plastic handle. There are no identifying marks on it but I suspect it came from Japan. I still use it for everything. Once I thought it had been dumped in the trash with some trimmings and I rooted through the bag of trash but it wasn’t there. I finally found it in the dishwasher where I should have looked in the first place. I love that knife. Aside from knife love, I adore your blog. Twenty years ago we discovered utility knives in France, deep in the countryside, at a hardware store. We bought three, and gave away two as gifts. We had more than enough knives, but none that cut tomatoes, fruits and vegetables so quickly and easily. In the intervening years, we have acquired two more. They are in constant rotation, with one on the cutting board at all times. The only question is, how did we manage before we found them? I am always looking for a really short paring knife which for me has a multitude of uses. My favs are at Dehillerin, pure carbon steel. Enter store and turn left down aisle past the caisse. At counter level on the left are an assortment of these house brand paring knives, about three different sizes. From about €8 to 14. I buy a couple each time as they tend to disappear! For the best knives ever, check out Haburnknives.com. The guy is fantastic; helpful, will design to please, is meticulous beyond anything I have ever seen. And the followup care is also unheard of in this day and age. His knives are, I am convinced, the best out there. My favorite is this 4″ Victorinox Classic Paring Knife with Serrated Edge, Spear Point. It’s only like $8.00 on Amazon. I worked in a kitchen store for couple of years. I have very nice expensive knives but I love my $5 Messermeister tomato knife. It is serrated and came with a protective shield. I bought and gave away a lot of them but I still have 2 that I use regularly. I also my Kyocera ceramic paring knife. After retiring as a chef for 30+ years I have ended up with a huge drawer insert full of all kinds of knives. Probably 50 of them! Why? Its scary. But I do use many of them. Some excellent and expensive and some old carbon knives that can be sharpened very well. But after picking up a Ikea serrated like the one you show, I find we grab for it all the time. They even sell some super razor sharp ones with a sheath for a few bucks. Good to keep in the car to cut things when on an outing or if you cant wait to eat something from the grocery. Thanks David for a great blog. Love this recommendation..but now wondering what shoes you found comfortable when standing on your feet 24 hours a day! Just before my last trip to Paris, I received an email offer for a Frenching knife with a curved blade for cleanly removing all the detritus from a lamb chop or crown roast. This Clickbait seducer wanted $60 for it, so I waited to go to Dehillerin for a real French one. Try to imagine the look of supercilious disdain I received; I was unceremoniously dumped in front of a bin of humble paring knives, where the employee turned on his heel and left me in disgrace. Nikki mentions Kiwi knives in her comment and I also recommend them. Probably easier to get in the Southern Hemisphere, readily available in Sydney’s Asian supermarkets. Despite the name, they’re made in Thailand, huge range of sizes and very cheap. Delighted to find them as the knife of choice in a cooking class in Hanoi. Here in Southern California the Kiwi knives are readily available in the Chinese / Vietnamese markets…my wife and I have several including a large cleaver that works great. My favorite serrated tomato knife is a cheap Sabatier I have had for ages…a bit larger than David’s I think but same look and feel. May I point out for the lefties in the crowd, this Oxo knife is strongly serrated for the right-handed person. As a lefty, my favorite knife is equally inexpensive, available everywhere, of the same general design and quality, but serrated on a more neutral plane. Here’s a link. These are my favorites too. I use them every day. The last time I visited an elderly friend, I could barely tolerate her knives, so I sent her two of these. My favorite utility knife is a super old, serrated 5″ workhorse sold by SE Rykoff with a red handle. Do you remember that company? Their knives were manufactured by Wustoff Trident, which they sold as well. I used to work for them when I was very young. When I left, they never asked for the demonstration set back so I took the entire SER & Wustoff set with me. I could have never afforded that kind of quality at 22 yrs old and I still use all those knives daily. Ron & Bette: Those little Victorinox knives are great too, and I have some of their regular paring knives, but the little serrated ones are shorter than this Oxo, and I find I can use this for larger tomatoes, grapefruit, and even cutting loaves of bread – if they’re not too large! Dianne: Yes, I actually brought some of these back to France with me and gave them to a few friends for Christmas. People don’t realize how not-good their knives are (or don’t care) but it’s nice – and safer – to use a knife that’s sharp. Jeanne: I remember Rykoff as a food service company and most of the food service companies had pretty good knives because restaurant cooks really needed ones that would hold up well. Diane: I wore SAS shoes, which aren’t super attractive, but the soles never wore down, and they were never uncomfortable. The model I wore doesn’t seem to be available anymore, but the Guardian and Time Out both look close. Yes, this! 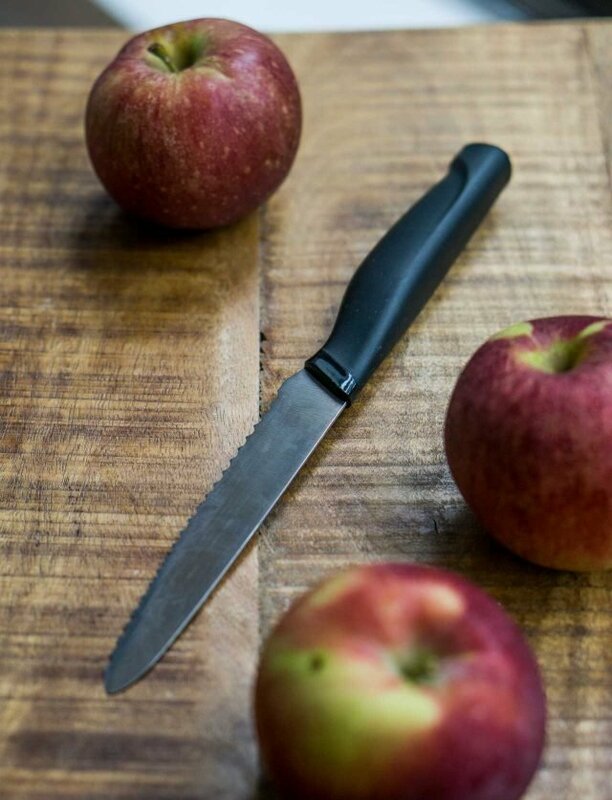 I use an serrated Italian knife called Kaimano all the time, it’s sold as a ‘table’ knife but it’s perfect for fruit, meat slicing – everything. I reach for these over my fancy knives all the time. An Italian friend demonstrated it on an orange I was butchering with another knife and insisted I take it, she then gave me a set of 6 more and they are definitely up there in my top kitchen items. Ditto! 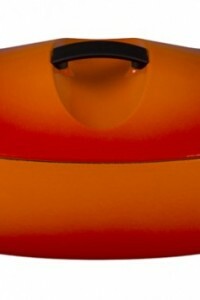 I first started using what I call a tomato knife five years ago, part of a Fiskars set. But it’s my favorite knife of all time — for bread, first cuts into vegetables, fruit, meat, etc. It’s the size, in part, but the serration is just so useful. Glad to have a couple of new sources since mine’s beginning to show its wear. 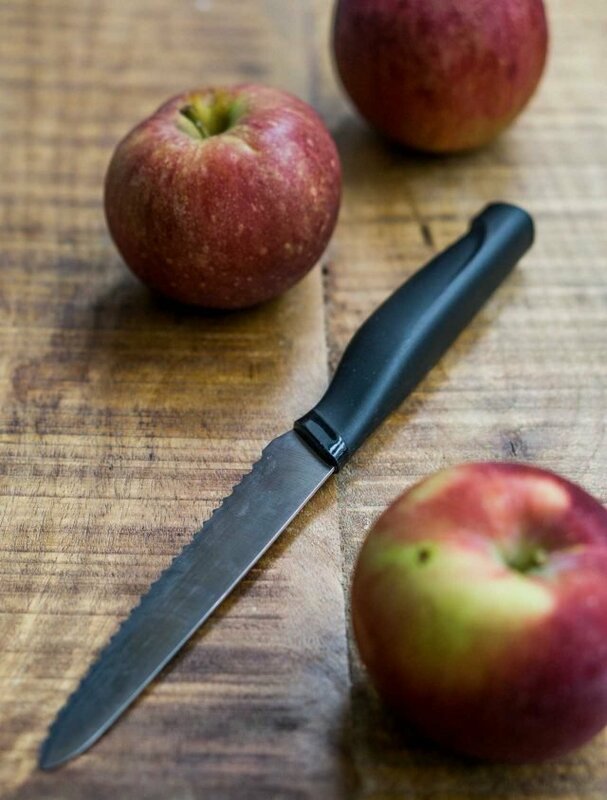 The knife looks great, but it’s that striped and speckled apple that has me fascinated. An apple that looks like that just has to have fabulous flavor. My mouth is watering! Reaching out after reading a comment you posted some years back on this blog, referencing Balthazar’s whole grain bread. Came upon it while searching for the recipe to this amazing bread. I”m dying to make siilar, and wondering if you’ve tweaked your recipe further since 2014? I put this in my Amazon cart this morning at around $10 and was going to check out tonight and the price has gone up to $20!! This is a very consoling post for a non cook like me. I have a similar knife with an unreadable brand except ‘stainless portugal’. So very, very useful for tomatoes, cheese, fruit chopping. 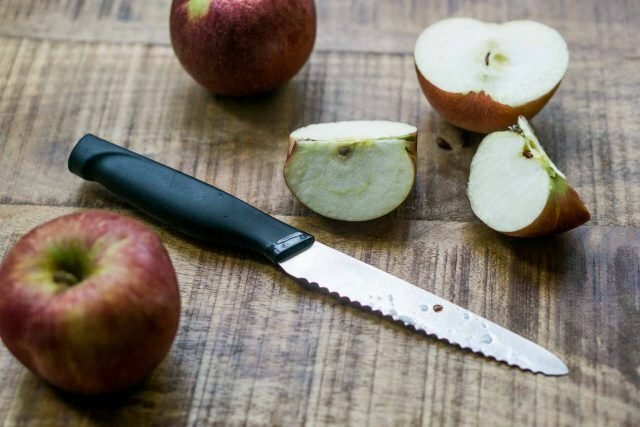 Great read on Knives and their place in the kitchen, Its funny I was only having this conversation with my friend the other day when he was moving into his new home. There he was ready to spend hundreds on his fancy knife, Never hardly cooks… Typical of shinny things and kitchens hey! Anyways wonderful advice and thanks for sharing.